So, after over-sharing lately on how inept I feel about my art, I've been bombarded with wonderful comments, e-mails and articles that have made me realize one very important thing: I am never alone. I think humans like to think that they we are always the exception when having certain feelings. But, truthfully, we never are. I have read quite a few articles about amazing artists doubting themselves. And, today, I found this article. I don't like to talk a lot about my condition, though I have mentioned it a few times. But I do find that whenever someone talks about illness people tend to tune them out. Basically, we each have our own problems. 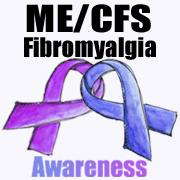 But, this IS my blog and I should be able to raise a bit of awareness about CFS/Fibro. It's really a terrible disease that robs you - and has robbed me - of many things, including my youth. I was diagnosed while in high school, and most of those years are a blur. I had to transfer out of my educationally-promising specialized high school and be home schooled for a while. After that, I attended two more high schools before I was barely able to make it through my valedictory speech at a MUCH less prestigious institution. I wasn't able to make it through college because the schedule and the stress were too overwhelming for my body. I gave it a go, but after 3 months I had to withdraw. I was (by the grace of God) able to dedicate two years to volunteer work, which to this day is still on the top of my best-things-Sandy-did-with-her-life list. I've been really fortunate to find love and understanding from my close family and friends but, to this day, there are still those (including some relatives) who don't understand why I am so fragile. I do look pretty healthy. But that's just it... you can't always judge a book by it's cover. After reading the article that I linked above, I can appreciate that I am never alone in how I feel. Who in their right mind would have imagined that the best-selling author of "Sea-Biscuit" would have such a similar story to tell as I do? The days and weeks and months that pass by, and the lack of support from the medical community, leaves you feeling drained and confused. I am pleased to say that I have learned how to deal with my condition. Though, I do have bad spells. But I still feel that it has robbed me of the person that I could've been. And, I realize now that that is the reason why I blog. We all have something special to contribute to each other. Just because my voice has been muffled by an illness doesn't mean I am not going to try my hardest to scream through that and be heard. I am a person with a chronic disease that has no cure, but I am also a person with passions and opinions and contributions. And in the words of Laura Hillenbrand: "I'm looking for a way out of here. I can't have it physically, so I'm going to have it intellectually." In my case, I'm going to have it creatively. So, if you're a reader of this blog, I do hope you feel like you know me better now. While I do like to have my privacy and not over-share, I also think that everyone should know about this disease. And, maybe one day, you'll come across a really lethargic and somewhat depressed yet intelligent individual and you'll say: "Hey, maybe she just has what Sandy has;" and you'll give them a chance. And, then, this post will have been totally worth it! I hope you have a wonderful weekend, and that you have the energy to enjoy it! If you are so inclined, feel free to donate to CFS research here. P.S. CFS and Fibro are arguably two distinct diseases. In my case, I was diagnosed with CFS, which is more fatigue-centric. But, as time has passed, I have developed Fibromyalgia, which is more pain-centric. The diseases usually go hand-in-hand, and many of the symptoms for both tend to overlap. I have had every feeling that the author described in her essay - and a few she didn't. Just wanted to make sure no one is confused. Wow! Sandy, I am so sorry that you have suffered these sicknesses so early in life. It's so comforting to know that in the future, none of these sicknesses will exist in the future. But what do we do in the meantime? Well, I will continue to pray for those who suffer chronic illnesses. It's not fun having them, I know from experience. Hang in there, continue with your creativity. You are awesome!